Im sure you have heard about studies done on medications, supplements, foods, herbs, etc. In a lot of cases, the outcome is not the honest truth but you would never know unless you were doing the study. Not everything is disclosed and in some cases, only short term effects are looked at on a very small group of people. Here is an example about a natural tea that is said to cause miscarriages and labor. I had a friend that was pregnant and I told her to drink red raspberry tea because it was good for the female reproductive organs and good for pregnant women (and non pregnant women as well). I like it and drink it sometimes myself. I'm talking about the good quality leaves, not the junk that you tend to find in over priced herbal boxes. Her response was, no, I wont drink that until I'm ready to go into labor. My midwife (I think she said) said it will make me go into labor/miscarry if I drink it. The problem with that, it isn't true. I wasn't going to argue with her. There are thousands of women, over the span of centuries, that have and do drink this tea during pregnancy, so how can people say it causes a woman to go into labor? Where did they get this from? 1. They teach this in nutrition classes in college. Since this is being taught in classes, people take it as fact, and spread the lie. 2. As mentioned above, people hear about this and spread it around as fact. 3. Some books state it as fact. Jo Francks, a Master Herbalist, shared that this all may have come from a study in 1954. Fractions were isolated from Rubus.sp and applied in vitro to the uterine tissues of guinea pigs and frogs. Scientists discovered 1 fraction acted as a spasmolytic (relieves spasms) while another causes uterine contractions. Scientists love doing studies where they extract a chemical out of a plant and doing tests with it. This can cause bad side effects that don't normally occur when using the whole plant, or just the parts of the plant (stems, leaves, roots). So, this study may be the cause of this lie about red raspberry leaf tea that people spread. It is a wonderful plant that provides various vitamins, minerals, and other beneficial properties. 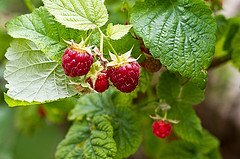 Link to Raspberry photograph on Flickr. Join in and write your own page! It's easy to do. How? Simply click here to return to Article.